DC Comics announced today at WonderCon that it will relaunch Justice League Dark, this time with the help of Wonder Woman. Justice League Dark will be written by James Tynion IV with artwork by Alvaro Martinez, Raul Fernandez, and Brad Anderson. 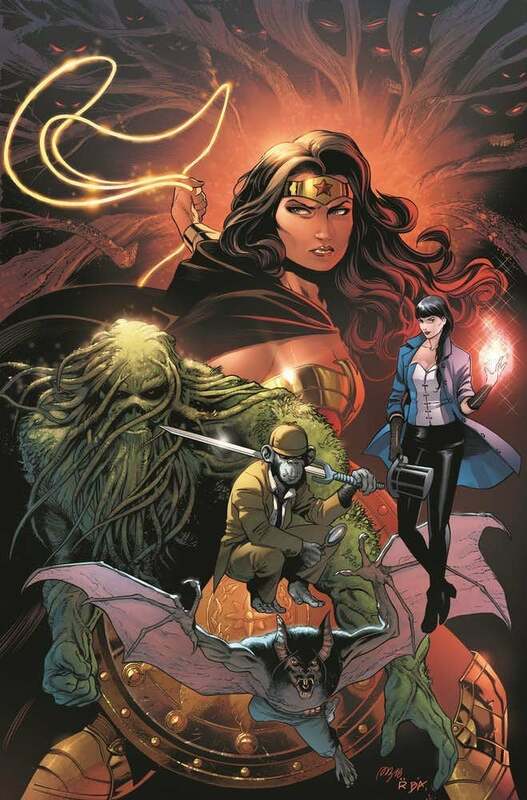 The team’s roster includes Wonder Woman, Swamp Thing, Man-Bat, Zatanna, and Detective Chimp. The Justice League Dark series, as well as the new Justice League relaunch and the cosmic-themed Justice League Odyssey, will all fall under the fresh ‘New Justice’ publishing banner spinning out of the Justice League: No Justice event. The original Justice League Dark was launched as part of DC Comics’ New 52 reboot. The series, whose title was originally just a placeholder, featured DC Comics’s mystical heroes solving mystical problems. The original team lineup included John Constantine, Madame Xanadu, Deadman, Zatanna, and Shade, the Changing Man. The team handled threats that were mystical enough in nature to fall outside the Justice League’s usual scope and capabilities. Their first mission pit them against the Enchantress, who had gone mad. Later, the group’s lineup shifted to also include the vampire Andrew Bennett, Black Orchid, Doctor Mist, Frankenstein, Mindwarp, Nightmare Nurse, Pandora, The Phantom Stranger, Princess Amaya of House Amethyst, Timothy Hunter, and Zauriel. Justice League Dark ran from 2011 through 2015, concluding in March of that year. Its safe to assume that DC Comics is banking on Wonder Woman’s newfound popularity since her film’s debut, and her ties to the mystical side of the DC Universe, the help bolster interest in the new Justice League Dark title. Justice League Dark was adapted into an animated film that released in early 2017. The film featured several of the core team members along with Etrigan the Demon and a guest appearance by Batman. The film was R-rated, only the second of DC’s animated films to earn the rating, and saw Batman asking for aid from the group in solving a supernatural mystery. A live-action Justice League Dark movie is in development at DC Films. Originally pitched by Guillermo del Toro under the title Dark Universe, del Toro has since left the project and its direction has changed. Doug Liman was once attached to direct but left to direct Chaos Walking instead. Justice League Dark launches in June.